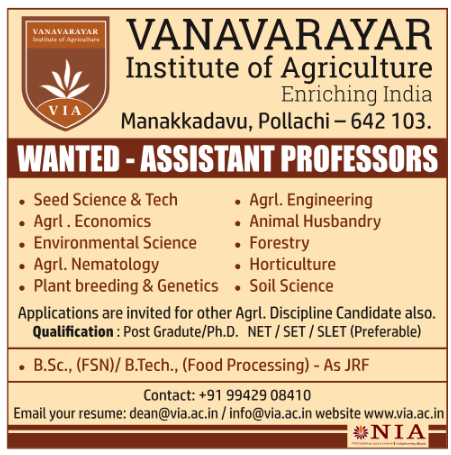 Vanavarayar Institute of Agriculture, Pollachi has advertised in the DINAMALAR newspaper for recruitment of Teaching Faculty- Assistant Professor / JRF jobs vacancies. Interested and eligible job aspirants are requested to apply immediately from 03rd February 2019. Check out further more details below. About College: Vanavarayar Institute of Agriculture, we believe in enriching India through younger generations who are dedicated and understand the cultural importance of Agriculture. Agriculture will remain for many years a major contributor to the economies of most developing countries. The agricultural sector in developing countries is undergoing rapid changes as a consequences of both technological progress and economic forces, which call for an increased market forces, competitiveness and higher productivity. How to Apply: Interested and eligible candidates are requested to send their application along with CV, copies of certificates, PAN card, Aadhaar card and recent passport size photo to the email address given below.